Concerns about climate change, the vulnerability of large energy systems in a highly turbulent political world, increasing electricity consumption and the need for efficiency always push the rethinking of energy systems. As a result, a number of new concepts, some vague, some old repackaged, others inconsistent have been advanced in the field lately. The rethinking of energy systems refers to both the sources and the assembly of the conversion systems as well as to each component: generation, transport, distribution, storage and consumption. A concept recently used in power generation is "microgrid". Instead of micro, nano or picogrid, a new concept of energy cell, in general, and renewable energy cell in particular has been proposed, especially since the size does not matter. In the thesis we call it the photovoltaic cell most often. What we are looking for is the presentation of the structure and functions of these cells. The concept of renewable energy cells involves a group of consumers, energy sources, storage facilities that operate as a single controllable system and provide both electricity and heat in its location by acting autonomously or interconnected with the public network , by JT. Between renewable energy cells we deal with photovoltaic cells, as the solar resource is "democratically" everywhere. The concept of a photovoltaic cell is best represented by a wider concept of Distributed Energy Resources. For clarity and to overcome a lack of understanding in this approach to the integration of renewable energies in national electricity systems, the energy systems in Germany and Denmark have been studied. 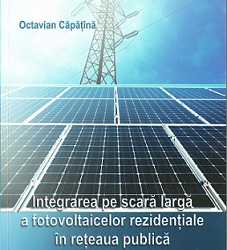 An assessment of photovoltaic energy developments in Germany and Romania has been made in terms of regulations. In the thesis a residential photovoltaic cell with storage and connected to the public grid is proposed, so a new type of isolated and connected photovoltaic cell in the same time. For technical, economic analysis and for cells study, a special software tool, an application called KOSON written under the Matlab development environment, was created. As absolute novelty, KOSON randomly shapes the flow of daytime solar energies day after day over a full year, and is modeled to the average monthly deviations set by NASA through multi-year observations. Data from 590 in 590 seconds from the SEN* was collected for one year and processed to create a consumption pattern as close as possible to real consumption needed for modeling of the large-scale integration of residential photovoltaic cells. The modeling has been done for several consumer profiles to derive the most appropriate profile for a household to be fed priority from its own photovoltaic cell. For this purpose, a programmable device was built to collect consumption data and the residential consumption profile. It has been attempted to see how much photovoltaic energy can the SEN accept by quantifying the effect on power gradients in the case of a 1.7 GW photovoltaic input, in addition to the one from large photovoltaic installations. A coefficient, called VES, was proposed to measure the "wind vulnerability" to the solar one. The conclusion was that the addition of 1.7 GW was not negative in the SEN, but rather has several positive effects which were highlighted. Furthermore, the presence of 13 GW in large photovoltaic installations, which flows on average in SEN, is still not equivalent to the problems created by existing wind power plants. A new type of residential photovoltaic cell with storage facilities that can operate in isolation and connected to the mains at the same time (FSCR-Photovoltaic with Storage and Connected to the grid), has been set up, which almost covers the consumption requirements considered to be typical, at the moment. A new type of bidirectional inverter has been defined. This new type of energy cell, FSCR, has also established an evolution to what the author thinks will be the future - the intelligent energy cell. It has been determined by modeling that a mid-day consumption profile helps fuel security for the coming days, as increasing storage capacity does not solve the problem of cold season months. Examining the capacity of roofs of individual and private homes to support photovoltaic panels, this potential was calculated at 20GW. The economic potential of middle-class people, with an annual income of over € 12,000, is about 10% of the total active population. From the intersection of the two crowds it was found that approximately 500,000 individual and private homeowners could invest between 2500-3000 euros to produce a kWh of 0.07 € instead of paying 0.14 € per kWh to distributors. Increasing the difference between the two prices may be the engine for which the middle class opts for the investment in the residential photovoltaic cell. Finally, three methods have been developed, each implemented in software, to see the effects of this scenario of a broad integration of small residential photovoltaic cells: its own energy output of half a million homes in SEN. The results of the modeling show the validity of the proposed solutions, the SEN becomes more stable because the components will be under loaded, the SEN consumption curve will flatten and more power will remain, about 150MW, in the reserve for adjustments and for incidents and major accidents. The widespread integration of small, residential, photovoltaic cells adds the advantage of geographic space, which would increase the production of photovoltaic cells. 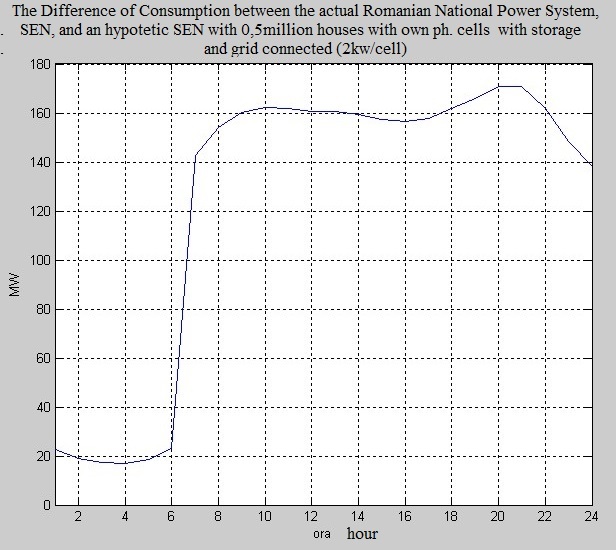 The hypothetical situation in which all 5.15 million private and individual houses in Romania would be equipped with photovoltaic cells with conservation and connected to the network were also investigated; in this case average consumption in the country would decrease by 1200MW (~ 18%). Overall conclusion: The more small, residential, geographically-spread photovoltaic with storage facilities and grid connected will be integrated into the SEN, leads the SEN becoming more stable and more capable of coping with gradients power generated by major accidents or the wind turbine windfall. Conclusion with socio-financial implications: Romania can add at least 1GW of photovoltaic energy to SEN in photovoltaic cells with storage and connected to the grid without investing a penny, and this integration has positive effects on the stability of the national electricity system.